Isao Takahata's somber animated film has been on my radar for a long time. During the early days of the Filmspotting podcast, they watched it during an anime marathon and raved about it. They also described it as one of the saddest movies they've ever seen. I've heard a similar reaction from others during the past few years, which made me hesitant to check it out. Don't get me wrong; I have no problem with watching unhappy movies. It was the extreme focus on that part of the movie that made it seem difficult. Thankfully, I took the plunge during this Readers' Choice Marathon. Eric from The Warning Sign submitted a bunch of good suggestions, and it worked out that Grave of the Fireflies was the only one that I hadn't seen yet. 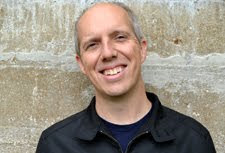 Eric's blog is excellent and discusses both movies and video games. His ongoing movie projects are particularly cool to check out. Last week I enjoyed the unconventional World War II film Devils on the Doorstep, which takes place in China. This story occurs during the same war but from a Japanese perspective during the conflict's final days. Fourteen-year-old Seita (Tsutomu Tatsumi) and his four-year-old sister Setsuko (Ayano Shiraishi) live in Kobe near the end of World War II. After their mother (Yoshiko Shinohara) is killed during the fire bombings, the orphans are forced to live with their uncaring aunt (Akemi Yamaguchi). She treats them like freeloaders and speaks nastily towards them, which make Seita wonder if they'd do better on their own. Their dad is a navy officer fighting the war, so he's unable to help the kids (if he's alive). All the adults in the besieged town have their own problems, so it's hard for most of them to care about the orphans. 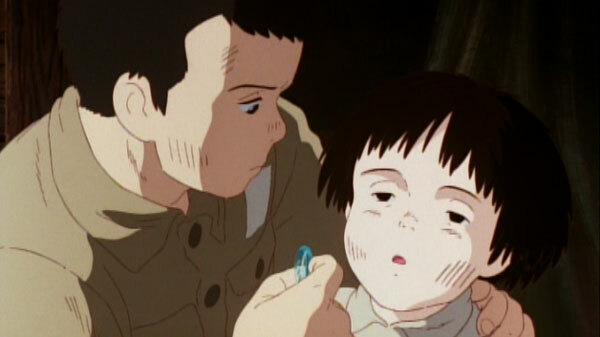 Seita and Setsuko struggle to stay alive and keep the faith within this nearly hopeless situation. 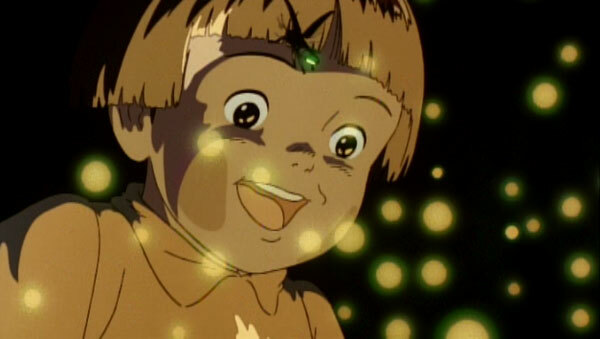 Although Takabata claims that he wasn't making a statement about war, it's impossible to watch Grave of the Fireflies and not leave with an anti-war message. The destructive effects on both individuals and the society as a whole are striking. It's true that Takabata is telling a personal story inside a war-torn environment, but that doesn't make its overall effect any less convincing. It's based on the semi-autobiographical novel by Akiyuki Nosaka, who watched his sister die from malnutrition during the war. This intimate connection to real-life events is felt throughout the film and makes it even more powerful. Beyond the saddening impact on Seita and Setsuko, the war also drives other adults (including their family) to become selfish people. Everyone is looking out for themselves, which creates a rift in the community and leads to a "survival of the fittest" mentality among the citizens. We spend most of the time with Seita and Setsuko, and both are realistic characters who act like you'd expect kids of their age to respond. He's mercilessly tormented by his aunt for not being more responsible, but he does quite a lot to keep up his sister's spirits. Watching him break down when he realizes she knows about their mom is a tragic moment. He's tried consistently to keep her death a secret from Setsuko, and his callous aunt tells her without a second thought. I have a three-old daughter, and I saw a lot of her in the young girl's responses to each situation. Setsuko is a tough kid, but it's really hard for someone of that age to keep completely removed from her routine. We're engaged in the stories of both characters because they're down-to-earth figures who don't seem removed from people we meet in our everyday life. Even the aunt's perspective is understandable and isn't truly evil, even if she treats the kids poorly. Although the setting is wartime Japan, some of the best moments are the quiet ones apart from the chaos. A highlight is the appearance of many fireflies outside of their shelter. They bring them inside the mosquito net and lighten the room, and it's a gorgeous moment. The downside is the next day, when the dead fireflies end up symbolizing a lot more to Setsuko. The happy times also stand out because they're so rare amid the daily struggle. Even though they're hurting physically, Seita and Setsuko are still a brother and sister who have fun together. They may not survive to reach the end of this journey, but there are a few respites from the suffering. The beauty of nature still appears in this hellish environment, and the fireflies show there's still a glimmer of hope for humanity. Takabata's career has rolled into many genres, so there's no clear vision that connects this movie to his other films. 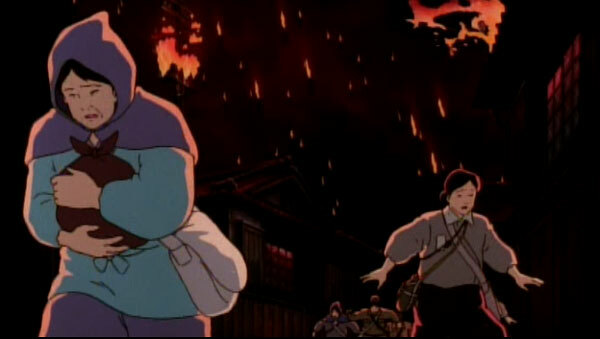 It's clear that Grave of the Fireflies has an original style that differs from what you'd expect of anime. Even other adult-oriented animated fare rarely matches this story's weight. The intimate look at the lead characters makes us care about them a lot more than we may expect. 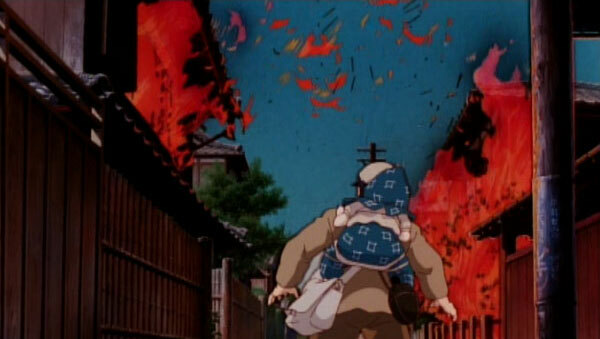 Takabata does create some impressive attacks with the fire bombing on Kobe, so it's hardly a lifeless film. Instead, he finds a way to keep us focused on Seita and Setsuko while keeping the story moving. There's no way around the depressing nature of their plight, but it never feels unnecessarily gloomy or manipulative. This is a surprisingly difficult question for such a great film. 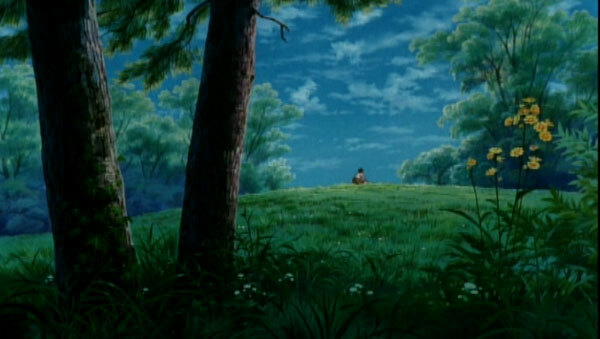 I'll admit that I was reduced to tears by the end of Grave of the Fireflies, and that's not a common occurrence. This is a sad movie that's going to be hard to sit through, especially for parents. That said, it's also the type of movie that everyone should see. If you're not already anti-war, it could definitely play a role in pushing you in that direction. I compare it to my experience of visiting the Hiroshima Peace Memorial and its museum 11 years ago, which really clarified my views against war. I challenge anyone to sit through this film and not be moved by it. Dan, I'm glad you were able to see this, but I'm also sorry for selecting such a bleak and depressing film for your current marathon. 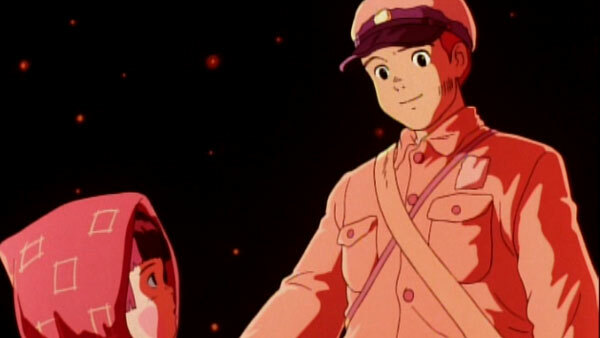 Grave of the Fireflies is a difficult watch, but it moved me in a way that very few films do. You're absolutely right -- the fact that this is based on a true story makes it even more heartbreaking. Even though it is incredibly sad, this ranks as the best anime film I have ever seen, if not the best war movie period. Also, thank you for the very kind words in the intro. I really dig your monthly marathons, and I was pleased to be able to select an entry for this one. It's cool, Eric. I'm really glad that I was able to see it, despite the depressing subject matter. I needed a bit of a push to finally check it out. No problem on the kind words; your blog is excellent. Thanks! Good review. This is one of the most depressing movies I have ever seen. While I can acknowledge how good it is because of the effect it had on me, I won't ever be watching it again. Whenever someone tries to tell me animated movies are only for kids I always suggest they watch this one. Thanks! I agree that it's also one of the saddest movies that I've ever seen. It takes a lot for a movie that affect me that much, and I agree that I likely won't see it again.